The IMA® Committee on Ethics and Raef Lawson, CMA, CFA, CFP, CPA, Ph.D., IMA VP of Research and Professor-in-Residence, are proud to announce that Matthew W. Fish and William F. Miller, CPA, have won the Best Case Award in the ninth annual Carl Menconi Case Writing Competition for their case, “Brand X Company’s 300% Tariff.” The competition is named in memory of Carl Menconi, who held leadership positions in IMA for many years and served as chair of the IMA Committee on Ethics. The objective of the competition is to develop and distribute business ethics cases with specific application to management accounting and finance issues and that use the IMA Statement of Ethical Professional Practice as a reference or guidance tool. The winning case and teaching notes are available for use in a classroom or business setting. IMA academic members can access and download the teaching notes from the Academic Teaching Notes library in LinkUp IMA. Others who want to use the case and notes should contact Kerry Butkera at kbutkera@imanet.org. Jay Kemp, controller of Brand X Company, brimmed with excitement as he completed his passport application at a Post Office in Wisconsin. Completing the application brought him one step closer to Shenyang, China, to which he had been invited by his boss, Brand X owner Karl Gengler. Except for a couple of fishing trips to Ontario, Canada, Jay had never left the country and was looking forward to the new experience. Jay had been invited to travel to Shenyang with Karl and Bob Hamilton, the company’s director of engineering, to meet with attorneys and auditors from the United States Department of Commerce (USDC) at the manufacturing plant of Shenyang Furniture Ltd. The meeting was supposed to be a two-day audit of Shenyang Furniture’s manufacturing cost data that Bob had submitted to the USDC to prove Shenyang Furniture was earning a profit on the wooden bedroom furniture it was selling to Brand X. The audit was part of a larger antidumping case filed by U.S. furniture manufacturers claiming Chinese furniture manufacturers were selling furniture below cost to U.S. distributors and retailers in an effort to drive U.S. furniture manufacturers out of business. Located in northern Wisconsin, Brand X Company is a relatively small, family-owned manufacturing company with average annual sales around $20 million. Karl Gengler, owner and founder, has a professional background in sales and marketing, having held several senior-level sales positions with publicly traded printing product companies prior to founding Brand X. At Brand X, Karl built a culture that emphasized the sales process and minimized other organizational functions, such as engineering, accounting, human resources, and quality control. Karl viewed both internal and external regulation as an impediment to sales growth. Due diligence and compliance were a distant afterthought and only necessary after a sales contract had been secured. When Brand X was awarded a $2 million contract to provide all of the furniture for an upscale resort in a popular tourist destination known as the Wisconsin Dells, Karl didn’t think twice about compliance issues that might surround his plan to import the furniture from a manufacturing plant in China. The contract to furnish the resort marked the first time that Brand X would import product directly from a Chinese manufacturer. 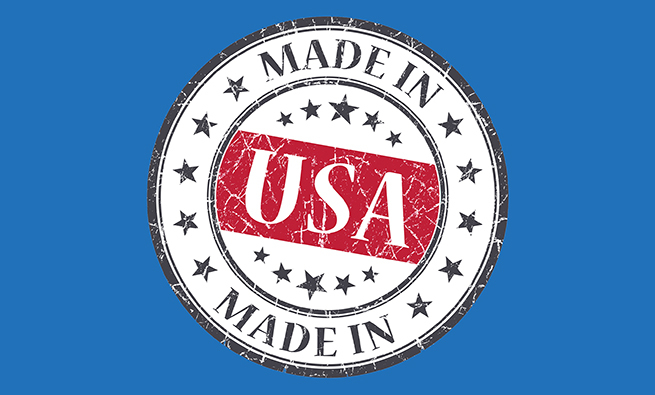 Importing products from foreign countries is common practice in the United States, but most organizations that import products utilize brokers who vet manufacturers based on quality, price, and capability. Brokers also guide an importer through import laws relevant to the product being imported. 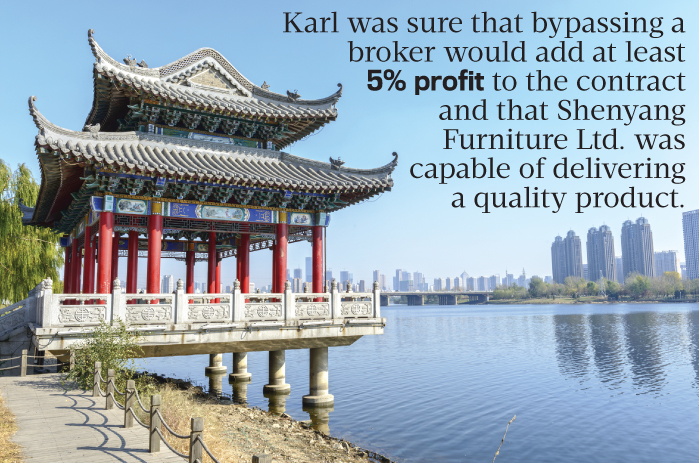 Rather than use a broker, Karl decided to import directly from Shenyang Furniture Ltd., a company he discovered through an industry acquaintance. Karl was sure that bypassing a broker would add at least 5% profit to the Wisconsin Dells contract and that Shenyang Furniture was capable of delivering a quality product in a time frame that would allow Brand X to complete the sales contract with substantial profit. Prior to his arrival at Brand X, Jay had been the corporate controller for a contract manufacturing organization that specialized in plastic extrusion products. Jay implemented several internal controls at that organization that tightened and improved the sales quotation process. These internal controls included having all price quotations for new products calculated by an individual independent from the selling process, having all product price quotations verified by the corporate controller prior to customer notification, and having raw material cost and lead-time verification from at least two independent and reliable vendors. When he joined Brand X, Jay suggested that the sales process be tightened by implementing similar internal controls. Karl, however, believed Brand X would lose sales because of the extra time it would take to verify vendor pricing and double-check internally generated price quotations, so Jay’s suggestions weren’t implemented. Karl was notorious for securing sales contracts prior to receiving vendor pricing commitments, and he often based projected profit margins on calculations he made on a yellow legal pad while sitting in a recliner watching football games. As the company owner, Karl had the latitude to run the organization as he chose and often balked at the controls Jay suggested. These controls may have slowed the sales process, but Jay felt they would provide important safeguards against inaccurate sales quoting and erroneous lead-time commitments made to customers. Jay did the best job he could within the confines of the controller role as defined by Karl. He worked hard to provide Brand X’s lending institution with accurate interim financial statements, reasonable pro forma financial statements, and complete borrowing base certificates so that debt covenants were met and short-term borrowing needs could be planned and modified on a regular basis. When Jay asked Karl for a detailed projected margin analysis of the Wisconsin Dells contract, he wasn’t surprised when Karl handed him several pages of notes written in pencil on yellow legal pad paper. 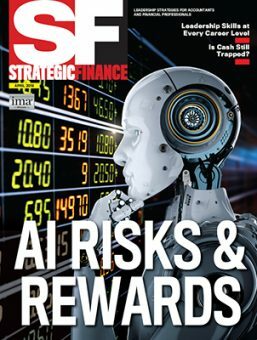 Jay needed the analysis so that pro forma financial statements could be updated accordingly and included in the monthly reporting package distributed to the lending institution, the advisory board, and the executive management team. But Jay could barely make sense of the figures that were sprawled across the paper horizontally and vertically. After several hours of analysis and consultation with Karl, Jay constructed a margin analysis report for the Wisconsin Dells job based on the assumptions Karl provided (see Table 1). Jay was skeptical of the expected profit but found comfort in the fact that Karl showed an anticipated contribution margin of approximately $670,000, or 39% of the entire Wisconsin Dells job. This exceeded Brand X’s typical margin on domestically sourced sales by nearly 10%. Because Jay expected costs to surface that Karl hadn’t anticipated, he included an additional $250,000 in the analysis for unanticipated import-related costs. Jay’s instincts told him that even Karl’s worst guessing and estimating shouldn’t consume more than 15% of the expected revenue from the Wisconsin Dells job, so he was comfortable providing these figures to the bank and other stakeholders. Karl worked closely with Shenyang Furniture management and provided them with engineered drawings of the furniture, packaging instructions, and a nonnegotiable delivery schedule. Before Shenyang Furniture sent its first shipment of furniture, Karl made several trips to China to ensure that the furniture was constructed to a level of quality consistent with customer specifications and that the manufacturer was making enough progress to meet the delivery dates. Karl told Jay on several occasions that the importing process seemed relatively easy, and he was pleased with his decision to bypass a broker. He clearly felt confident in his ability to satisfy the sales contract without any major hindrances. With progress being made and his optimism high, Karl was naturally dumbfounded when he opened a letter addressed to Brand X Company from the USDC. The letter stated that there was a 300% antidumping duty for new shippers of wooden bedroom furniture from the People’s Republic of China. Because Shenyang Furniture was considered a first-time shipper, all of the furniture would be held at the port of entry, Los Angeles, Calif., until the 300% tariff was paid in full. Karl told Jay the bad news and asked Jay to secure funding to pay the tariff so that the furniture could be released and sent to the customer in fulfillment of the contract. Jay became alarmed as he worked with the bank to secure funding for the tariff. The anticipated $670,000 margin had instantly turned into a deficit of more than $1.8 million (see Table 2). Jay knew the costs associated with the tariff would place Brand X in violation of several debt covenants and severely restrict the company’s cash flow well into the future. Jay was concerned the bank might throw Brand X’s existing loans into default. While Jay was pessimistic, Karl was certain there had to be a way around the tariff. He was motivated to do whatever he could to avoid the tariff on the furniture that hadn’t been imported yet. 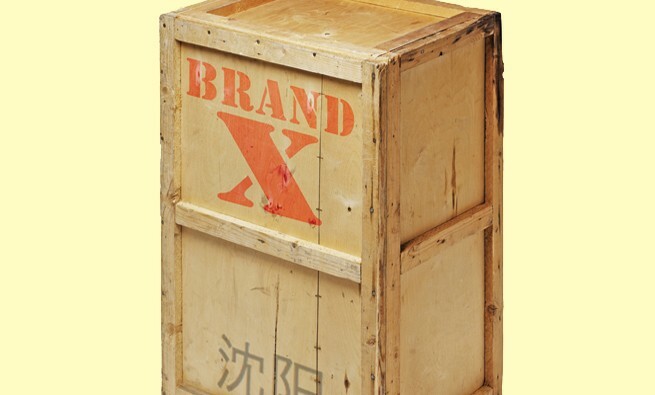 He asked Shenyang Furniture to ship the remaining furniture unassembled and labeled as “wood parts” rather than “TV stand,” “dresser,” “headboard,” “nightstand,” or “end table.” Karl believed his tactic would disguise the shipment as wood instead of furniture, enabling Brand X to avoid the tariff because it wouldn’t be importing wooden bedroom furniture. In addition, Karl contacted several staff members at the USDC to ask for an exemption from the tariff because the amount of wooden bedroom furniture being imported was immaterial and posed no threat to the U.S. furniture manufacturing industry. 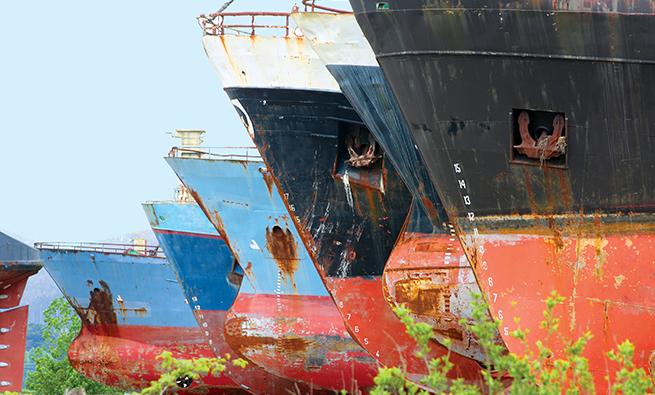 Karl was told the USDC was willing to review the financial records of all new shippers in order to establish a factory-specific tariff for the manufacturer based on the costs of the shipper relative to a predetermined standard. Karl knew an audit of manufactured costs was his best course of action in obtaining a refund of the tariff. Jay’s presence at the audit seemed appropriate given his position as corporate controller of Brand X. But Karl delegated responsibilities of the audit to Bob. Although Bob was familiar with the furniture manufacturing process and understood standard costs, he was an engineer. Jay believed an accountant familiar with overhead cost allocation schemes and material and labor rate calculations should coordinate and correspond with auditors. Bob completed cost schedules and corresponded directly with both Shenyang Furniture and the USDC without consulting Jay. Therefore, Jay didn’t know what data had been exchanged between the parties involved in the audit. Jay shared his concerns with Karl about being excluded from the audit planning and was told not to worry about it. Karl claimed he had everything under control. After 36 hours of travel, Jay, Karl, and Bob arrived at the international airport in Shenyang, China. They arrived on a Friday. The audit was scheduled to start the following Monday. Their plans to spend the weekend sightseeing, visiting local shops and markets, and meeting with the owners of Shenyang Furniture were scrapped when the auditors and attorneys from the USDC arrived on Friday asking for a pre-audit meeting. Karl asked to meet with the auditors and attorneys privately before the start of the pre-audit meeting. He believed the relationship-building skills he had perfected as a sales professional could win over the audit team. He felt he could convince them to grant a favorable tariff rate to Shenyang Furniture if they understood the adverse impact the 300% tariff was having on his business. The auditors wanted nothing to do with relationship building and warned Karl that any attempt to influence the audit was illegal and wouldn’t be tolerated. At the pre-audit meeting, they presented a lengthy list of data they needed by Monday morning because the data Bob had supplied in the prior months was incomplete, was inconsistent, and often conflicted with previously submitted data. Karl eventually realized the mistake he made in giving Bob the responsibility to correspond with the auditors. With a look of despair, Karl asked Jay to work over the weekend with the accounting group at Shenyang Furniture to collect and compile the data the auditors requested for the audit on Monday. Jay worked diligently, logging more than 18 hours each day as he tried to overcome a difficult language barrier to gather the detailed cost analysis the auditors wanted. The auditors were mostly interested in schedules that outlined how much each piece of furniture actually cost the factory to produce. Throughout his career, Jay had created many manufacturing bills of material and manufacturing routings with standard and actual costs for products, but he was accustomed to using detailed computerized records written in his native language. Unfortunately, Shenyang Furniture’s records were handwritten in volumes of bound ledgers. Jay spent most of his time asking for translated copies of production-related records that would display the number of pieces manufactured as well as source documents indicating prices paid for raw material. Jay toured the manufacturing facility, reviewed payroll records, and weighed component parts, such as screws and dowels, to establish a verifiable manufactured cost per completed piece of furniture. Jay had access to the data and information for the prototype headboard that Brand X manufactured during the contract negotiation, including engineered drawings and the costs of raw material, labor, and overhead. With that, he created a comparative cost analysis of the headboard produced in China with the actual cost to manufacture a headboard in the U.S. He hoped this would establish some relative reference for the calculations he would be providing the auditors (see Table 3). The analysis frustrated Jay. 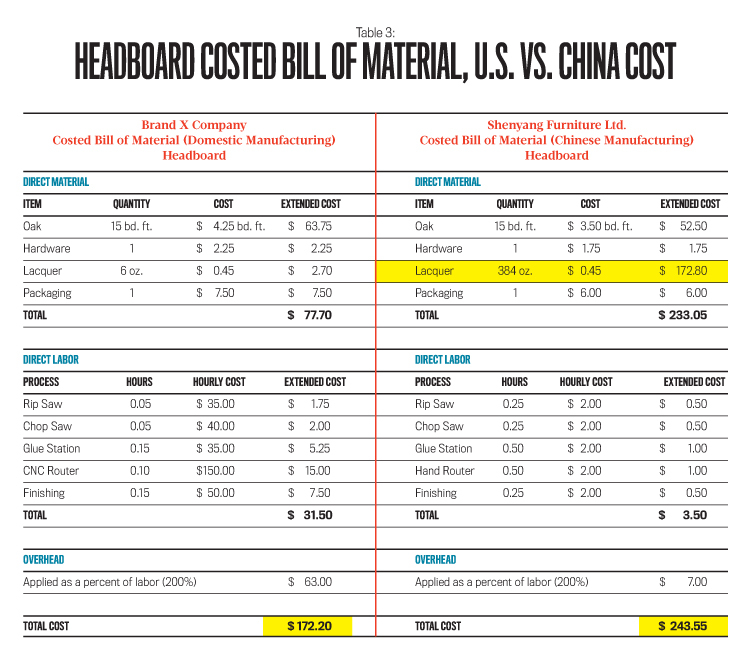 He knew he had correctly calculated both the Chinese and U.S. costs, but the Chinese costs were well above the U.S. costs to manufacture the headboard. The major difference between the Chinese and U.S. costs was the amount of lacquer (the most expensive material input in the process) required to seal the headboards. According to the records provided by Shenyang Furniture, each headboard required three gallons (384 oz.) of lacquer. Jay knew it was physically impossible to apply three gallons of lacquer to each headboard because the lacquer would need to be applied at a thickness greater than three inches. Jay argued his point with the lead manufacturing engineer, production manager, and cost accountant at Shenyang Furniture and demanded accurate figures to provide to the auditors. The Shenyang Furniture employees said their actual production records indicate three gallons of lacquer were applied to each headboard. They told Jay that if the auditors required source documents tracking actual costs, they would need to create records for him to provide to the auditors. Jay’s patience was running thin as the sun began to set on Sunday evening. He had to make a decision on what data he would give the auditors on Monday morning. 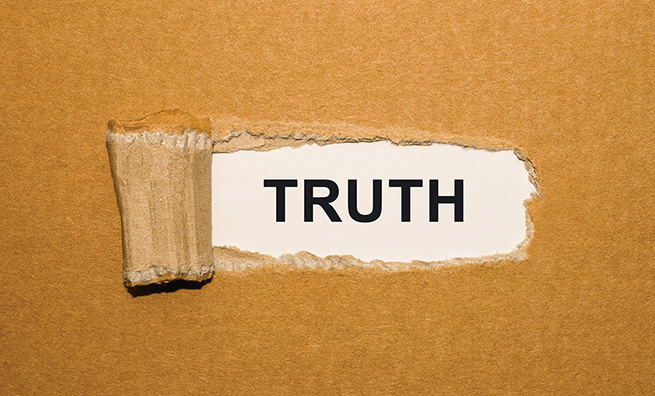 If Jay presented the flawed data exactly as he had received it, the auditors could increase the 300% tariff to reflect Shenyang Furnture’s actual costs, possibly resulting in additional tariffs on the imported furniture. If Jay presented what he thought was more accurate cost data, Brand X could receive hundreds of thousands of dollars in refunds from the USDC for previously paid tariffs. If you were Jay, what would you do? Why? Is there anything Jay could have done to prevent the dilemma from happening in the first place? Be specific as to what and how he could have gone about it. As the controller, what obligations does Jay have, if any, regarding the owner’s decision to mask future shipments as wood instead of furniture? What would you have done? What are the four overarching ethical principles that express IMA members’ values and standards that guide their conduct? Describe what options Jay has in preparing and presenting data for the auditors when they return on Monday morning. How does the IMA Statement address each of the options described? 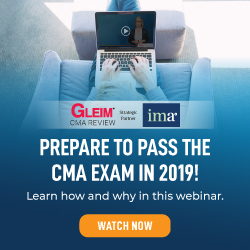 What resources are available through IMA that can assist Jay in his immediate decision on what information to provide the auditors? Does the IMA Statement cover the actions taken by Karl to mask shipments from China as wood parts as opposed to wood furniture? According to the IMA Statement, what is Jay’s responsibility relative to Karl’s action? Describe the ethical resolution process outlined by the IMA Statement. How could Jay have applied the resolution process to his decision on what information to provide the auditors? What is corporate governance? Describe how poor corporate governance contributed to the events surrounding the tariff. What is a control environment? What are the major elements of a control environment? Describe the strengths and weaknesses of the control environment at Brand X. What are internal controls? 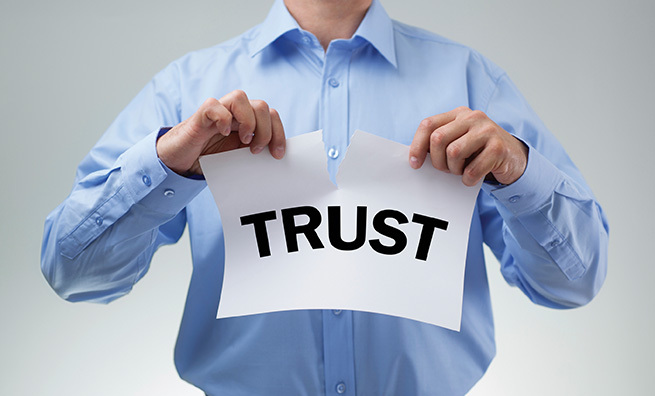 What makes an internal control effective? What could Jay have done differently that may have prevented the events that unfolded during the pre-audit? Provide examples of internal controls Jay could have developed to help mitigate risk for Brand X during the sales bidding and contract process. Define an “ethical and responsible tone at the top.” How does an ethical and responsible tone at the top impact the development and implementation of an effective internal control system? What is a costed bill of material? Describe how a bill of material can become part of an effective internal control. What is a costed routing? Describe how a routing can become part of an effective internal control. Describe actual costing. Do you believe it was appropriate that the auditors asked for cost data based on actual costs? Explain. Describe standard costing. Describe how standard costing could have been used and verified by the auditors during the audit. Matthew W. Fish, Ed.D., is an assistant professor of accounting at the University of Wisconsin–Eau Claire. He also is a member of IMA’s Chippewa Valley Chapter. You can reach him at (715) 836-2476 or fishm@uwec.edu. William F. Miller, CPA, Ed.D., is an associate professor of accounting at the University of Wisconsin–Eau Claire. You can reach him at (715) 836-5434 or millerwf@uwec.edu. Great Case….I think sf should consider creating additional space for cases such as this one.